Nissan banished any residual memories of the dull but worthy third generation Primera in the striking shape of the fourth generation car, introduced in 2002. 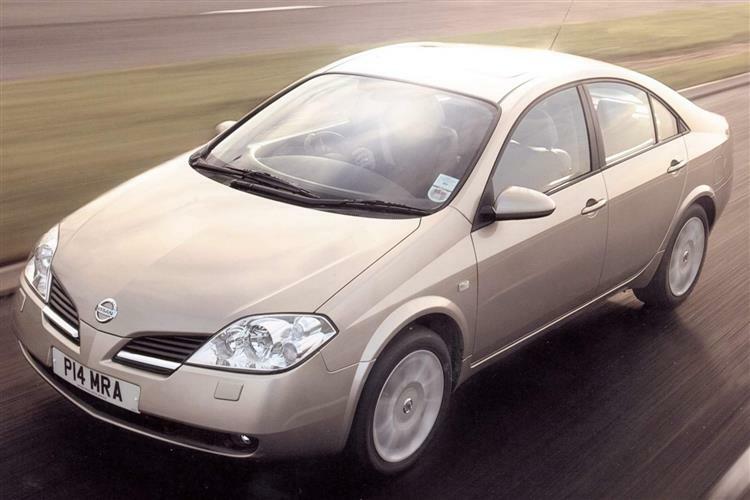 With a number of technological breakthroughs for the medium range class, the Primera was rapidly hailed as the car that could dethrone the all-conquering Mondeo. Unfortunately, the pace of progress meant that it didn't turn out that way for the likeable Nissan, but with residual values hardly stratospheric, it's possible to land this interesting car at surprisingly affordable price. Before this fourth generation car, the Primera was notable for two things. Mainstream models were beloved by cabbies and few others whereas the GT version offered a great sports package but was blessed with a face only its mother could love. February 2002 saw an all-new Primera radically alter our preconceptions about middleweight Nissans. With a sleek, bulbous body shape and an interior that heralded a new family design for the Japanese company, the Primera instantly made all its rivals look a little old-fashioned. The diesel engine initially offered was a 124bhp turbodiesel that was a little long in the tooth, but Nissan soon saw fit to replace this unit with a 136bhp common-rail dCi diesel engine. A factory-warranted 1.8-litre LPG version was also introduced at the tail end of 2002. Changes brought in during the spring of 2004 saw the Primera's exterior styling unaltered but various modifications to the interior and boosted equipment levels made the car a more desirable proposition. Rear parking cameras and satellite navigation on all bar the entry level models made the Primera one of the best equipped cars in its class. By the early part of 2006, the Primera range had been slimmed down to one engine - the 1.8-litre petrol - and three trim levels in preparation for the axe. It still looked decent value for money with all that equipment included. By the early part of 2007, the Primera had disappeared from the pricelists. This Primera was styled in a Munich design studio and whereas the Nissan culture was previously to dilute the more radical excesses of the initial sketches to the point of timidity, the board okayed the Primera design with no changes. So let's start with the basics. There were hatch, saloon and estate models offered in S, SX, SE, SVE or T-spec levels of trim. Though priced a little higher than Primera customers had paid in the past, Nissan was quick to point out that the car was safer, more comfortable and better refined, as well as being significantly better equipped than its rivals. Forget all that though: it's the styling that caused most comment. The exterior lines are pleasantly swoopy with a very European feel to them. Designed to look like a "proper driver's car", the Primera scores in that crucial first few seconds of acquaintance. The rear three-quarter view has that high-haunched look of the original Skoda Octavia, the curves, bevels and planes being very well judged. Even the corporate Nissan nose manages to avoid looking like something that's melted in the sun, instead integrating between bumper and bonnet without that suspicion of afterthought that permeates many earlier Nissan efforts. Underneath, the bodywork is a stretched and reinforced version of the Almera platform, and although the Primera has a decent road presence, the evidence of the tape measure shows it to be a good few inches shy of equivalent generation Passat and Mondeo dimensions. It's longer, taller and wider than its predecessor, however, and used many clever packaging tricks to increase interior space. Widening the track and stretching the wheelbase helped too: the boot on the four-door car is a useful shape and able top swallow 465 litres. Running counter to many designs of the time, the four and five door cars have been styled to look nigh-on identical, whilst the estate version goes for a trendy Sportwagon-style sloping roofline. The interior is even more adventurous than the voluptuous bodyshell. Three main dials are perched inside a central binnacle, below which is housed an LCD screen with a 'keyboard' of various buttons on a shelf in front of it. A less extreme version of this school of thought was previously trialed in the X-Trail off roader, another model which, incidentally, uses the Primera platform. The centrally-mounted instruments and bold use of colour contrasting found favour with X-Trail customers and Nissan have developed the theme here. With the exception of early models, even entry-level cars feature a colour LCD screen and electric rear windows, although plusher variants also have voice-activated electronic functions and a DVD-based satellite navigation system was offered, becoming standard after the 2004 facelift. All models feature climate-controlled air conditioning, front, side and curtain airbags, a 6-speaker CD stereo, a trip computer, electric mirrors, remote central locking, front electric windows and ABS. Privately owned Primeras are unlikely to have been thrashed, such is their mature appeal. Watch out for high mileage company hacks, but even these should stand up to the rigours of a 40,000 mile year better than most. Nissan trialed a great deal of new electronics systems on the Primera and although it has so far proved admirably robust, expect big bills if the rear view camera or the Birdview DVD navigation system does go wrong. Mechanically the Primera is as close to perfection as you're likely to find in this sector. Damaged catalysts can be costly to repair and check on oil or coolant leaks. Make sure that diesel sellers aren't valuing a 2.2-litre TD as a superior 2.2-litre dCi version. Though the 111bhp 1.8-litre petrol unit was the most popular of the three Primera engines available in the UK, it's not the most interesting. More diverting attractions lie with the 2.0-litre petrol unit - a powerplant that cranks out 139bhp and which is mated to a six-speed manual transmission or a CVT transmission with sequential manual override switching between six artificially mandated gears. A 138bhp common rail turbodiesel completes the engine line-up, offered with a six-speed manual only. Slow initial sales of this model prompted Nissan to reduce its price and up the engine output, making the entry-level 2.2Di S a far more tempting proposition. The best engine is undoubtedly the later 2.2-litre dCi with its common-rail injection configuration. Nissan's engineers claimed to have made ride and handling key priorities with the Primera and boasted that of all the cars selected to benchmark the Primera's chassis and suspension set-up against, only the BMW 3 Series produced a better all-round result. As would be expected, they declined to mention what those vanquished by the Primera were, but many would question why Nissan would go out of their way to fix something that manifestly wasn't broken. Performance is nothing outstanding, the 2.0-litre petrol car capable of sprinting to 60mph in 10.9 seconds in CVT form. The CVT gearbox would probably benefit from driver experience, as novices can make excruciatingly jerky progress. The original diesel engine offers that sprightly acceleration with an average fuel consumption figure of nearly 49mpg but the dCi unit is smoother and offers better refinement. Although cars like the Mazda6 and the Honda Accord soon stole the Nissan Primera's thunder, this has only served to make it more of a used bargain than ever. With a range of solid engines, a whole heap of design flair and a quirky and distinctive personality, the Primera does almost everything asked of it. Keen drivers may find it a little soft-edged but this will mean that few cars will have fallen into the 'wrong' hands. Who'd have thought it would take a medium range Nissan to show that modernity needn't cost the earth and sensible needn't always equal dull?